It is crafted from the finest grain spirit distilled with a secret blend of the highest quality botanicals drawn from all over the world. The essential botanicals are: Juniper; Coriander; Angelica and Liquorice root. 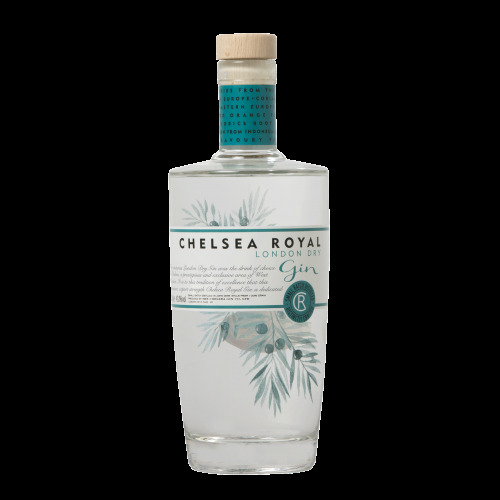 Additional botanicals have allowed their Master Distiller to create the rich flavour that is the hallmark of Chelsea Royal Gin. In particular, the combination of dried Sweet Orange peel and dried Bitter Orange peel from Spain transport the merged flavours, resulting in a zesty, zingy, vibrant and lively gin that packs a delicious citrus punch. Nose: Bright Juniper and orange citrus aromas are neatly balanced by Oriental spices of coriander and cinnamon. Palate: A soft harmonious union of aromatic Juniper and orange zest underpinned with yet more gentle coriander spices. Finish: Angelica dryness brings matters to a satisfying close.